Make the most of seasonal apples with James' baked Alaksa, the perfect retro dessert for impressing at a dinner party. For this recipe you will need a sugar thermometer, chef's blowtorch and a freestanding mixer or electric whisk. Preheat the oven to 180C/160C Fan/Gas 4. Grease and line a 23cm/9in round cake tin. For the génoise sponge, put the sugar and eggs in a large bowl and whisk until thick and pale. 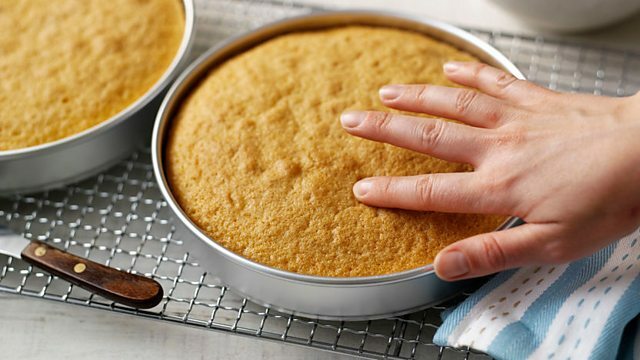 Fold in the flour and melted butter and pour into the prepared cake tin. Bake in the oven for 20-30 minutes, or until risen and springy to the touch. Remove from the oven and set aside to cool. When cool enough to handle, turn out on to a wire rack to cool completely. For the apple purée, put the apples, butter, sugar and 2 tablespoons water into a lidded pan and cover. Place over a medium heat and bring to a simmer. Cook for 3-4 minutes until the apples have become light and softened. Whisk the apples to a smooth purée, then set aside to cool. For the baked Alaska, bring 50ml/2fl oz water and the caster sugar to the boil in a saucepan (CAUTION: Hot sugar can be dangerous as it boils over very quickly. Do not leave unattended). 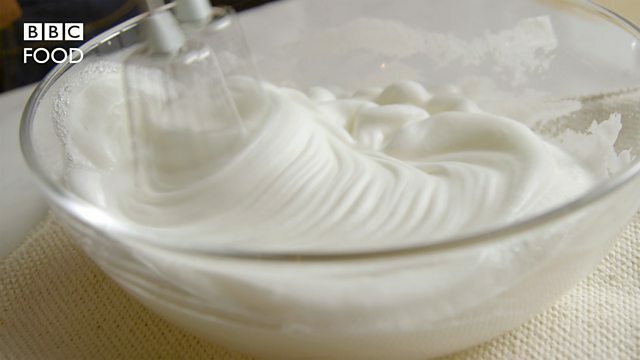 Meanwhile, whisk the egg whites in a large clean bowl, using a freestanding mixer or an electric whisk, until stiff peaks form when the whisk is removed. When the sugar reaches 121C on a sugar thermometer, remove the pan from the heat. 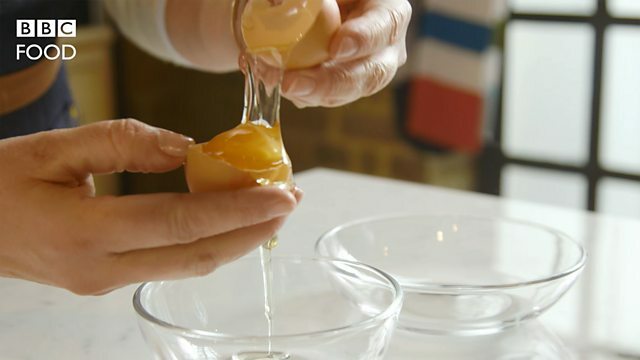 With the whisk or mixer running slowly, carefully pour the sugar syrup into the whisked egg whites in a thin stream, taking care not to let the hot sugar hit the beaters as it may splash. Continue to whisk until all the syrup has been incorporated into the egg whites and the mixture is glossy. Continue to whisk the egg white mixture at a slow speed until it has almost completely cooled (about 5 minutes). Cut a circle of sponge out using a plate or a cutter. Place the sponge circle on a heatproof serving plate and drizzle the calvados all over it. Spoon the apple purée on top of the sponge. Shape the ice cream in the centre of the sponge base. Spread half of the meringue mixture all over the ice cream and sponge base using a palette knife, making sure there aren't any gaps. Transfer the remaining meringue mixture to a piping bag fitted with a star nozzle and pipe it over the top of the meringue layer to decorate. Using a chefs’ blow torch, heat the piped meringue all over until it caramelises to a light golden-brown. Alternatively, heat your oven to its highest setting and place the baked Alaska into the oven for a few minutes. For the sautéed apples, heat a medium frying pan and add the butter, once hot add the apples and cook until golden-brown. Finish with the brandy and reduce until most of the liquid has evaporated. Place the baked Alaska on a serving plate and serve the sautéed apples alongside.